Many people have asked me why I haven't posted anything recently about Pepco's Energy Wise Rewards (EWR) program. The answer is in two parts: futility and futility. Second, it felt pointless to try and get Pepco to respond to the problems with their EWR program because they apparently have set a very low bar for success. The rest of this post will justify that assertion. I've had many conversations about the EWR program with Pepco and almost every one of them has included false, inaccurate, or unhelpful information. For example, last year Pepco discovered that the thermostat "could pose a potential fire hazard if the batteries leaked onto printed circuit boards" according to court documents. I received a robocall telling me to remove the batteries from my thermostat and I naturally called Pepco back for more detail. The representative responded that Pepco had made no such calls and I should leave the batteries in. Later I read in the newspaper that the thermostats Pepco provided were recalled so I'm a bit surprised that Pepco never came around to replace them. Perhaps pulling the batteries is sufficient. But then why are there batteries in the first place? A Pepco representative told me that the only reason for the batteries was so that the thermostat could still display a clock when there is a power outage. People check their thermostats for the time during an outage? Huh? The batteries must be there for some other purpose - presumably to maintain the settings through such a power outage. A Pepco representative assured me that the thermostats hold the settings even without the batteries. However, my own experiments showed that to be a misleading answer because while literally true, without a battery, the thermostat fails to update its clock. So after an outage, the thermostat will continue with the right settings but at the wrong times. Another Pepco representative finally admitted to me that it could take up to 24 hours for the thermostat to get back the correct time. Pepco continues to install the thermostats and sign people up for the EWR program. A Pepco representative told me that they have changed to a new brand of thermostat but I think the bulk of the problems are with the program and how Pepco administers it, not the thermostat. In fact, what originally sold me on the program was that I wouldn't ever have to deal with my physical thermostat. Sadly, this is not the case. These are solely my own comments. You can find other people's experiences in the comments at the end of this post and earlier posts on this blog. I highly recommend perusing the comments. That meant reprogramming all the settings into the new thermostat from its front panel, not a fun job since the interface requires hundreds of button pushes. It's hard to describe how bad it is. For example, to get to the first day's settings, you press the PGM key 10 times. (No, I am not rounding up.) To raise the temp from its default by 6 degrees requires another 6 button pushes. Now imagine doing stuff like this for each of 4 time periods for 7 days. Double it for heating and cooling. Double it again if you have a 2nd thermostat. (I have a two zone system.) Very painful. I never did program it because Pepco kept making statements (some of which were forwarded to me by the Maryland PSC) that the internet access was coming "soon". Rather than put up with the physical interface, I just put the thermostat on hold - for 3 months. Now I'm thinking that Pepco owes me the difference comparable to what I would've saved had I stayed with my previous smart thermostats for 3 months. And Pepco owes me another week's worth plus several hours that I had to take off from work. Why? Because it took Pepco that much time to get my thermostats working. Apart from all the web problems, Pepco decided that one of the thermostats was defective (no connectivity) and replaced it. Then they replaced my other thermostat (I'll mention why later). Pepco did eventually get the web interface running. And it is better than standing in front of the physical thermostat. But not by much. mode" so we're just looking at the 4 settings on Monday. The first problem is that you cannot compare days. That is, you cannot show Monday and Tuesday at the same time because of that "Select a Day" pulldown. The next problem is … oh never mind, I won't go through the rest of it. I will merely summarize that it is outrageously bad design - as if someone wanted to show off their prowess with HTML by having lots of separate form elements, tabs, pulldowns, and so on. A simple spreadsheet of all the settings in a single table would be much simpler. Indeed, Pepco's own documentation agrees and provides a spreadsheet template. But it's not even an Excel file. It's embedded in a non-editable PDF so all you can do is print it out. The worst kind of spreadsheet (paper) which then has to be laboriously rekeyed into the worst kind of user interface! This delay makes verification and debugging a very cumbersome process. After the 5 minute wait, it's made even more cumbersome because there's no short button sequence to check a setting on the physical thermostat. In my case, I use the 7-day settings and I first have to push-button my way through all the other settings I'm not using. And even then, there's no way to be sure that the thermostat is using the right mode (1-day, weekend/weekday, 7-day). The thermostat knows which mode it is in but won't reveal that to the front panel. So there's no way to directly confirm that the web programming worked. Between the delays, the lack of info, and the absurd number of button pushes to do anything, the system is a horror. The reverse problem exists too. The web page won't show what the settings of the physical thermostat. There's no way to query the thermostat from the web. Of course, that didn't stop a Pepco representative from telling me that the web page does reflect changes at the physical thermostat but he couldn't explain how to do it. Another representative told me it was impossible. It does seem like the website knows when it is wrong however. I occasionally see the message "Warning! This web page is not synchronized with your thermostat. Please choose your desired settings, then click SAVE to synchronize the settings with your thermostat." So the website is getting data from the thermostat - but not doing anything useful with it. I called Pepco and asked what was the most expedient way to confirm the thermostat had the right settings. No one to whom I spoke could tell me although they all agreed it was a reasonable request. I still don't understand the reason for the 5-minute delay in the web interface but surely it's an artificial delay and Pepco can bypass it during testing. So I called and asked: Could Pepco talk directly to the thermostat to confirm it was working? After many phone transfers, I ultimately found that there was one guy at Pepco (to be precise, at a contractor to Pepco) who could actually do such confirmation. During successive phone calls, I was informed that he was out of the office, on vacation, would return my call, etc. I was never able to reach him and he certainly didn't reach me. But what's the point? I don't want to have to call Pepco to confirm my settings. I want to do it myself. Unbelievably frustrating that their interface doesn't allow this. I've done enough research at this point to realize that the hardware they've deployed supports it; Pepco simply doesn't make it available to the customer. Why not? Other feedback elements are also missing. Pepco may be able to chart my temp and my energy consumption throughout the day. But they won't let me have it. Instead, their web page shows a generic explanation of my energy use by the month. But since they're not monitoring individual appliances, it's all hypothetical estimates based on a typical homeowner, not me. They had me fill out a survey of the number of TVs, computers, fridges, etc. So that narrows it down. But there is no connection to actual usage. There are companies that offer products that will do this kind of monitoring for you; But Pepco seems content reporting inaccurate figures on my personal account page that have little relation to reality. For now, I'd settle for a way to verify the programming. But according to Pepco representatives, there is no way for me to do it. There is no way to test a variety of potential connectives issues. There's no way to test signal strength. (The thermostat is wireless so if there's an issue with walls or transient problems with your microwave oven, it could be very difficult to solve. There's no way to test their router. (Pepco requires its own router; the thermostat cannot use an IP-style router that is traditionally used for internet service.) There's no way to open a direct connection to the thermostat via telnet or ssh. There's no user port to plug into. It's a black box. This need for verification is not imagined. Twice I've found the settings in the physical thermostat to be different than what I set them to from the website. Is it a failure of the thermostat? communications glitch? web interface problem? It's impossible for me to find out. The thermostat gives an indication of when it is communicating but it's just a simple icon on the display saying there is or isn't connectivity but it's unclear whether it's to the web or, more likely, just the router. And it's not even possible to see when the thermostat received its last update. Of course, I've been told exactly the opposite of many things I've discovered through trial and error. Some of the conversations I've had could have been right out of Kafka. The responses from representatives warmly embrace their own dysfunctional design as if was the most natural thing. And if denying reality or making up info or passing on incorrect info seems helpful, why not? Yet another problem occurs if you let the thermostat window idle too long. In that case, the session times out. However, it doesn't give an explicit timeout. Rather, after having spent a lot of time updating the configuration and then clicking Save to submit the new settings, the server throws them away and puts up the following screen. And, alas, it doesn't save your settings for when you log back in. In fact, you can't log in - because this login screen goes to some other page that doesn't know anything about you, hence the "Invalid Password" message. You'll get more and more frustrated because you'll never successfully log in to a page that looks like the regular Pepco login page but isn't. I reported that timeout and bogus login page to a Pepco representative who confirmed the problem and said it appeared to be a maintenance screen that the public was not supposed to see. He said he would make sure it was fixed. That was last year. It's still not fixed 6 months later. Ok, I'm getting tired of describing the various bizarre symptoms of an unreliable web service. So I'll switch gears to some lessons learned . . . Some of the Pepco thermostats are excessively noisy. Naturally, the one installed in my bedroom was one of these. Why would a digital thermostat make noise? No idea. But every few seconds, it would make clicking and grinding noises. Pepco came to the house, confirmed the noise, and swapped it out with a thermostat that made no noise. Let's hope they don't give my noisy old one to the next customer. Guests are guaranteed some interesting times at my house. My parents like to drop in for the holidays and stay over. This requires that I change the settings. It would be useful if there was a way to program alternate settings into the thermostat. Several such alternate settings would be nice. But no, the EWR website doesn't offer this. You have to laboriously revisit 7x4x2x2 settings and then when the parental units leave, you have to laboriously reset everything. Now it may seem like common sense that you cannot go back in time but what's the alternative? The website doesn't offer "Now" as a starting time; I was forced to pick a time a half hour later. It's crazy that the system doesn't let you change the temp for an entire half hour. My father watched as I made this discovery. He recommended returning the thermostats. Pepco: "This is after-hours service." Me: "I need help with my Energy Wise Rewards Thermostat." Pepco: "That department is closed. Call back tomorrow between 8am and 8pm." Me: "Wait, you don't have after hours service?" Pepco: "Yes, this is after-hours service. We handle things like AC or heat not working." Me: "Well, my AC isn't working!" Pepco: "Oh, ok, well, let me see if I can find a tech to help you. I'll call you back." Pepco: "Sorry but all the technicians are busy. Can you call back tomorrow and make an appointment?" Me: "Well, you're not giving me any other choice, are you?" 9:32am Called Pepco and described problem. Pepco: "I know there have been sporadic problems. I will escalate this. Don't be surprised if they're calling you back very shortly." 11:40 I gave up waiting. Left house to go to work. 6:00am Power out. My uninterruptible power supplies are all beeping so after ten minutes of hoping it will stop, I haul myself out of bed and power everything down. 11:28am After checking with the neighbors, I determine that only my house was out. So I called Pepco and registered an outage with their automated service. 4:00pm Several hours have gone by and I've eaten all the melting ice cream. Called Pepco for an update. Pepco: "Expect service back by 7pm." Pepco: "Have a nice holiday weekend." 7pm The technician said a squirrel shorted out a high-voltage line at the pole. (The dead squirrel at the base of the pole was a big hint.) He replaced an enormous fuse at the top of the pole and power returned to the house. Total outage: 12 hours. Time for Pepco to respond: 6 hours. Not bad for a single house. However, I'm still amazed that our electricity infrastructure is so fragile that a mere squirrel can bring it down. As I write this, it's been a week and, although power is just fine, the website is still not allowing me to program my 2nd floor thermostat. So today, I called Pepco and asked what's going on. After battling through their phone tree once again (and why does it have to ask me twice in Spanish to push numero uno at different levels in the tree? ), I finally reached a representative who put me on hold for 15 minutes and then told me that Deea would speak to me now. Ok, so Deea wasn't there. I hung up, redialed, went through it all over again and finally insisted the representative hear both my voice and Deea's voice at the same time before clicking off. Thankfully, she got us both on the telephone. Deea: "Our records indicate that your 2nd thermostat was removed in October of 2010." Me: "Yes, because it was defective. And you installed a replacement thermostat." Deea: "Not according to our records." Me: "So can you fix your records?" Deea: "Are you calling from home?" Deea: "Ok, then let's send a tech out to your house." Me: "Why? You just need to fix your records." Deea: "We need to get the # of the thermostat. That's why I asked if you were calling from home." Me: "No problem. When I go home this evening, I'll call it in." Deea: "That won't work. The office closes shortly. However, the technician can call it in because he doesn't have to through the office." Me: "So the tech works later than the office?" Deea: "Yes. The office closes at 5pm. The techs work till 9pm. Otherwise, you'll have to wait until Monday." Me: "Ok, send the technician." Deea: "What time is good?" Deea: "Ok, 8pm. The tech will call your home phone 15 minutes before arrival." We had this conversation around 4pm. I was home by 7pm. By 9pm, no one had showed. I checked my email and voice mail. Sure enough, I had received a call at 5:30pm. Technician: "I'll be there in 15 minutes." To make this clear, a Pepco representative had assured me a technician would show up at a specific time. I was there an hour early but the technician was there 2 hours early. He didn't wait. And all for the unnecessary reason that Pepco wanted to send a person out to read some numbers because 1) they couldn't keep track of their own records for work they had done and 2) their offices are open at different times then their technicians work. 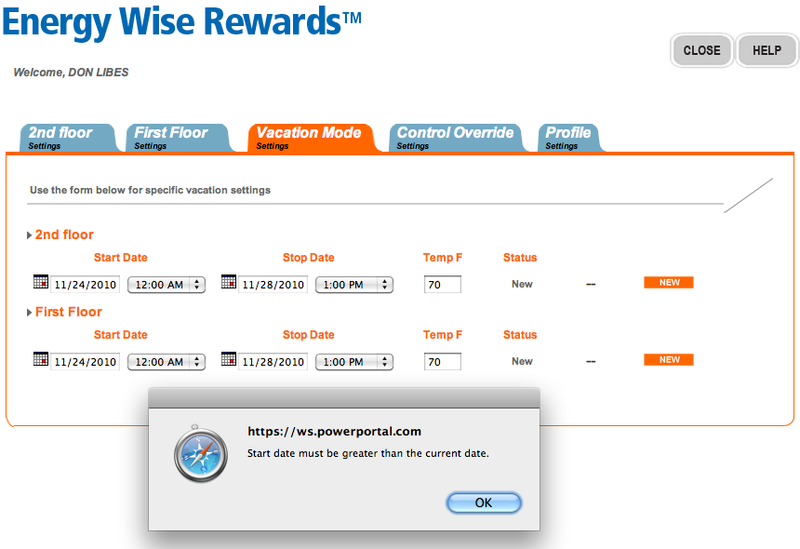 Although I've hung in with Pepco on this Energy Wise Rewards program for a long time, I'm run out of patience. Pepco isn't giving this program the support that it needs. It's just not a priority for Pepco no matter what it claims to the contrary. 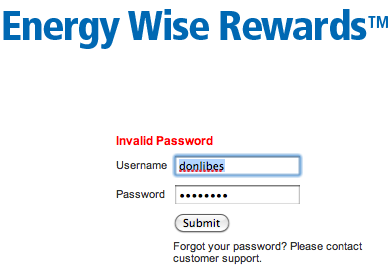 Thus, I strongly recommend customers considering the Energy Wise Rewards program to avoid it at all costs. While there is a financial reward tied to participation, it clearly is not worth it. And while the internet programming feature is attractive, I suspect that an independent provider would offer better support and better experience. Please let me know in the comments area if you've experimented with any other solutions for remote thermostat monitoring and control and whether or not you are satisfied. PS: As of 6/4/2011, my 2nd floor thermostat is still inaccessible from the Pepco website. The thermostat remains on hold. Labels: pepco thermostat fail "energy wise rewards"